"We have a new album that's about to come out. It's a gospel hymns album - old hymns that we grew up with. We worked with Ben Isaacs of The Isaacs bluegrass group, but it's not going to sound like bluegrass...it leans in the direction of the acoustical mind. They're old hymns with a fresh, new approach. We maintained the integrity of the hymn but have given it a fresh face. "I think we did really well. One of the songs we released to country radio is called "Rock of Ages," which is also the title of the album. Everyone who's ever gone to church and Sunday school will recognise the songs. All of us grew up singing them. We've cut gospel albums before, but this time we wanted to do songs we hadn't recorded. When we've performed gospel songs on stage, it almost felt like Jesus appeared in the sky, coming through the clouds." 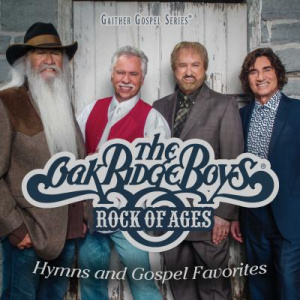 Rock Of Ages: Hymns And Gospel Favourites CD by Oak Ridge Boys was published by Gaither in November 2015 and is our 23651st best seller. The ISBN for Rock Of Ages: Hymns And Gospel Favourites CD is 0617884908324. Be the first to review Rock Of Ages: Hymns And Gospel Favourites CD! Got a question? No problem! Just click here to ask us about Rock Of Ages: Hymns And Gospel Favourites CD.